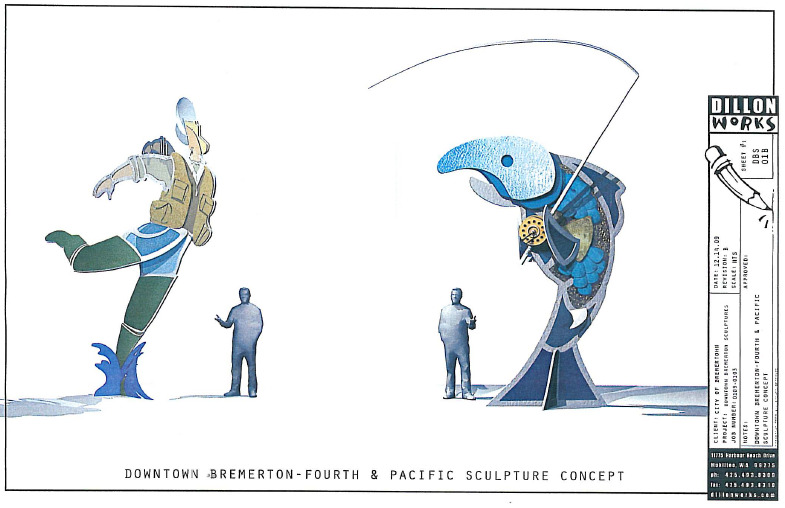 The latest rendering of the statues proposed for Fourth Street and Pacific Avenue offers more color and shows that the fisherman looks more like one you would see around here. It still has the fish winning, but I’m seeing if there is a newer version to reflect the council’s 4-3 anti-whimsy vote Wednesday. 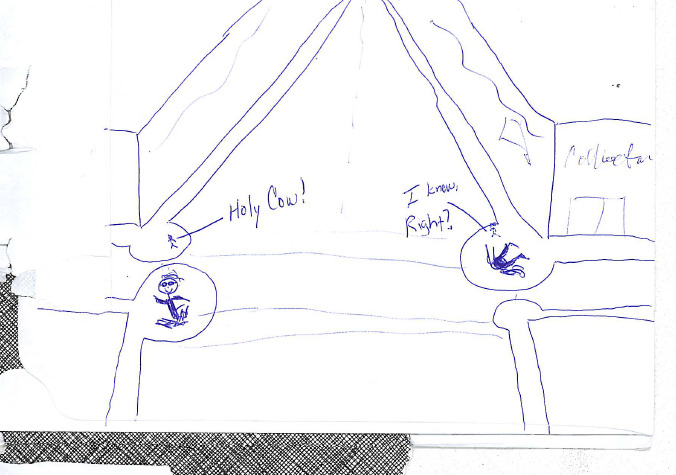 We had some ideas of our own for alternative statues at Fourth Street and Pacific Avenue. How about the images of the Kirk sisters or Nathan Adrian entering the water on one corner and coming out the other? It certainly passes the whimsy test. A fish and a fisherman is what we will likely get, barring some momentum from I-don’t-know-where that would overturn the council’s decision to install the two statues we’ve come to know. I’ve received an e-mail from someone suggesting there was opposition on this on artistic grounds. I’ll elaborate when I get it confirmed. One of the first comments was about unelecting the people who voted for this. Here’s the status of when they run again. Will Maupin — Up for re-election in 2011. Carol Arends — Just re-elected. Adam Brockus — Just re-elected. Ran unopposed. Nick Wofford — Just re-elected. Had an opponent who realized later he hadn’t lived in the district long enough. Brad Gehring — Just lost a re-election bid in a close race. Both Cecil McConnell and Roy Runyon, who voted “no,” and Dianne Robinson, who wasn’t in attendance, are up for re-election in 2011. Mike Shepherd, who also wasn’t there, ends his council service on Jan. 31. We’re looking into what would happen to the money if it were sent back to the state and other issues in a follow-up story. Finally, here’s my image of the swimmer. I drew it on the back of an envelope. Feel free to submit your own. I’m not saying there should be art on the corners, but if there’s going to be something different you might want to consider this idea by me. I’d say it’s in alignment with the idea of connecting Bremerton with the water. Then again, I don’t live in incorporated Bremerton, and reporters are not supposed to offer ideas anyway. It’s not part of that conspiracy theory pact we all signed. Voters in the Arends district really missed the boat a couple of months ago by not ousting her from office. Good news in the Shepherd district! My very good friend Greg Wheeler is coming in to that position. I have gotten to know Greg and his wife Sunny really well this past year. We have spent many a hours in the yards and at the homes of out other “10th Street” area neighbors (we all take turns hosting neighborhood events) talking about the issues of Bremerton, good city management and the need for thoughtful, methodical stewardship of taxpayer dollars. Greg will be a very valuable asset to the council. I am very happy with my own representative Mr. Runyon and Mr. McConnell most assuredly needs to stay. The out of touch dysfunctional others can and should be removed by the voters of this city. It is never too early to start. We, the taxpaying voters, did it at the Bremerton School Board level and we can do it at the city council level as well. The politician that needs to be replaced is the governor who signed the law authorizing the money for this street corner junkpile. The state has a huge deficit that Empress Christine told us didn’t exist during the campaign, and now they waste tax money on this junk.